In December, 2016, at age 16, Vineet Edupuganti was named the national winner of the Siemens Competition in Math, Science & Technology. His winning project was the development and modeling of a high-performance, low-cost biodegradable battery. This technology, which dissolves after a period of useful operation, can be used to power ingestible medical devices, environmental sensors, and other applications where dissolvable power sources are necessary or desirable. 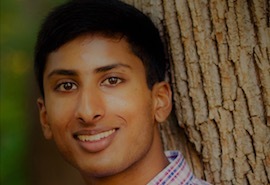 A recent graduate of Oregon Episcopal School, Vineet is now attending Stanford University, where he is studying Electrical Engineering and Computer Science. Outside of school, he enjoys tennis, playing the piano, and cheering on his hometown NBA team, the Portland Trailblazers. Vineet hopes to become a full time entrepreneur, bringing his research to reality as his new technologies give rise to real world applications.